FMC Corp., BASF SE, and Ashland Inc., the three top names in the Latin America excipients market for 2015, collectively held a share of 26.2% in the market’s total value for the year, according to market intelligence firm Transparency Market Research. The prominent entities in the Latin America excipients market are expected to pay more attention to factors such as a global program restructuring, centralizing their supply chains and consequently reinstate their position in the market, competitively speaking. Some of the leading players in the Latin America excipients market are also focusing on research and development to achieve a result-driven progress in the market, in order to boost their current business profile. As revealed in a research publication by TMR, the Latin America excipients market is expected to witness a surge in demand for excipients from the region’s overall pharmaceutical industry. 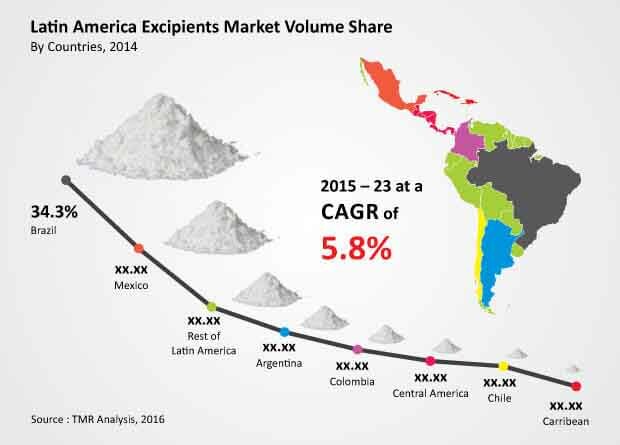 The Latin America excipients market was expected to reach US$626.9 mn by the end of 2023, in terms of demand scale and total opportunities volume, after expanding at an extremely promising CAGR of 19.33% within a forecast period from 2015 to 2023. The market was valued at US$403.83 mn at the end of 2016. “One of the primary factors promoting the growth of the Latin America excipients market now, and over the coming years, is the massive demand for excipients shown by the region’s pharmaceutical industry. Excipients are a high value commodity for the pharmaceutical industry as they are used as flavoring agents, tablet and capsule disintegrants, binders, as well as other common drug types. The Latin America pharmaceutical industry is expected to expand at a very high rate over the coming years, which is the lead reason to believe in the optimistic growth rate shown by the Latin America excipients market,” states a TMR analyst. There are expected to be plenty of opportunities for excipients manufacturers in this region. The report also shows that the segment of solid oral drugs is expected to rise in production rates and demand over the coming years. This segment is therefore considered to be a high value application segment in the Latin America excipients market over the coming years. The Latin America excipients market is currently battling the major issue of high raw material prices in the region. Their cost is high enough to completely deter most of the smaller manufacturers in the market, thereby restricting the overall growth rate of the Latin America excipients market. Corn, starch, and maize are the core ingredients of organic excipients, and all three already hold high priority and massive demands from the industries of food and beverage and renewable energy. The energy sector is looking to these raw materials to create sustainable energy sources, thereby creating a shorter resource pool for end users of the Latin America excipients market to pick one.